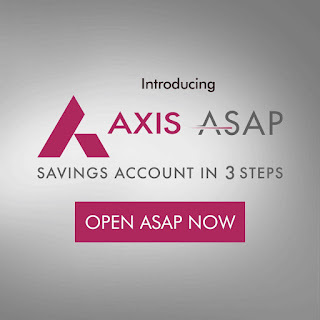 India’s Largest Private Sector Bank Axis Bank is Offering The Instant Account Opening Of Saving Account Which is Known As ASAP (as soon as Possible) Account Without Visiting The Branch. Users Can Take benefits Of Axis Bank Services & Axis Bank Offers In Flipkart & Amazon. So This is Huge Benefits With Just Account Opening. Best Thing About This Offer is You Don’t Need to Submit Any documents , You Don’t Need to Visit Any Bank Branch. You Can Open Account Within Just 3 Minutes With Your Aadhaar Card. How To Open AXIS ASAP Saving Account In Just 3 Minutes ? 4. 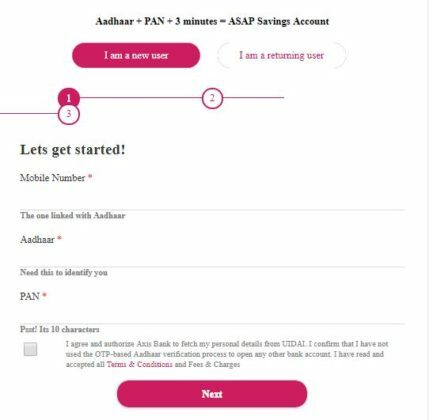 You Will Receive Aadhaar Based OTP On Your Number , Just Verify it & Put it in Next Step. 7. You Can Even Request Physical Debit Card Of Your Account On Nominal Fees. 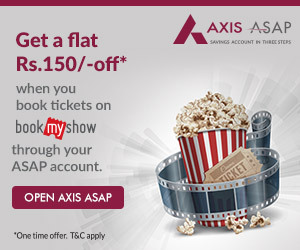 Bookmyshow is Offering The Rs.150 Cashback On Your Axis ASAP Saving Account Transaction. Flipkart & Amazon Used to Get 5-10% Off On Banks Like Axis & HDFC. You can Pay With This Virtual Card to Get The Benefits During The Sale.